Just a decade after entering the space race, China is headed to the moon. 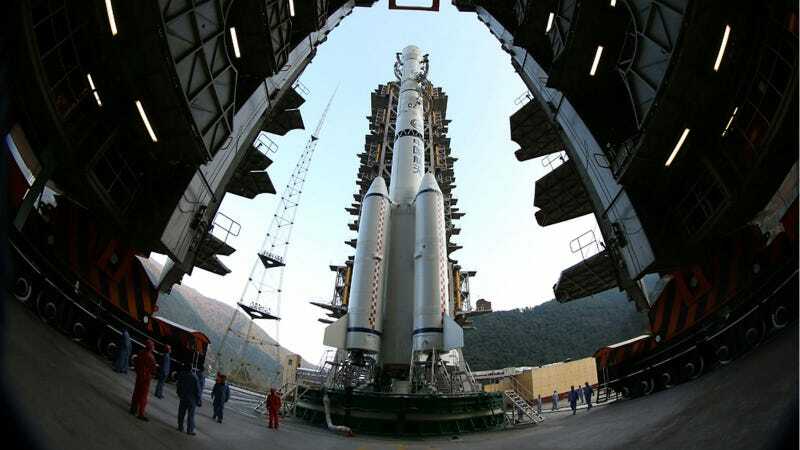 With the successful launch of a Long March rocket carrying the Chang'e 3 lunar lander earlier this morning, China is attempting to become the third nation in history to land (rather than crash) a spacecraft on the lunar surface. Named for the mythical Chinese goddess of the moon, the Chang'e lunar probe marks China's first attempt at an extra-terrestrial "soft landing"—a feat so far only accomplished by the US and the former Soviet Union. If all goes as planned, China will be the first nation to land on the moon since 1976. The probe is expected to arrive at the moon's Bay of Rainbows by mid-December and, following a successful landing, the Chang'e 3 will deploy a six-wheeled, solar-powered rover dubbed the "Yutu" (or "Jade Rabbit"). The Yutu will spend three months traversing the lunar landscape, studying the geological makeup of the moon's crust using ground-penetrating radar as well as setting up a telescope to study the Earth's little-understood plasmasphere.